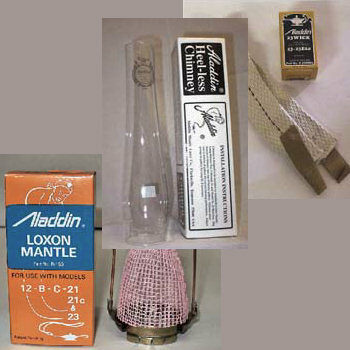 We put together the most common replacement parts for your Model 23 Aladdin lamp. Our Starter Pack of Aladdin Model 23 Replacement parts includes: 4 each R150 Lox On Mantles, 2 each N230 Wicks, and a R910 Heel-less Chimney. This is the right mix of Model 23 Lamp replacement parts for approximately 2,000 burning hours. Keep this handy bundle of replacement Model 23 lamp pieces handy for any emergency or power outage situation. This replacement part pack is offered at a discount - save some money wth this bundle!